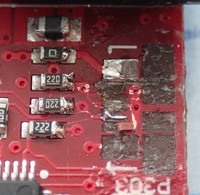 Due to incompetence, I have managed to break the USB connector of the shieldbuddy board. The pads came off along with the connector. Is my board dead or can I get some reasonable access to the USB lines elsewhere on the board? Yours in very little hope! Please send a picture of the damage! Here be a photo of the disaster area! 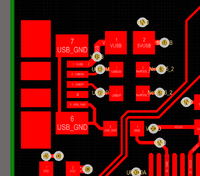 You could try soldering fine wires onto the remaining tracks to a new socket. We can supply picture of the artwork for that area of the board to make it easier. Are you in the UK? Thanks very much. That is extremely helpful. Will report on how I get on. Nah. No joy with the board. I think that the tracks are stripped. NB the schematics that you sent were not consistent with what I could see on the board. This may be due to me not seeing all of the layers. Got a new one. I think that it would be worth advising users that the USB connector is vulnerable to torsions produce by movement of the USB cable which is relatively massive compared to the connector. The potential for damage is much more likely in a development environment. I have now nailed the Shieldbuddy to a board and immobilised the USB cable - don't expect any further problems.